Europe's refugee conundrums - Website of business-of-migration! 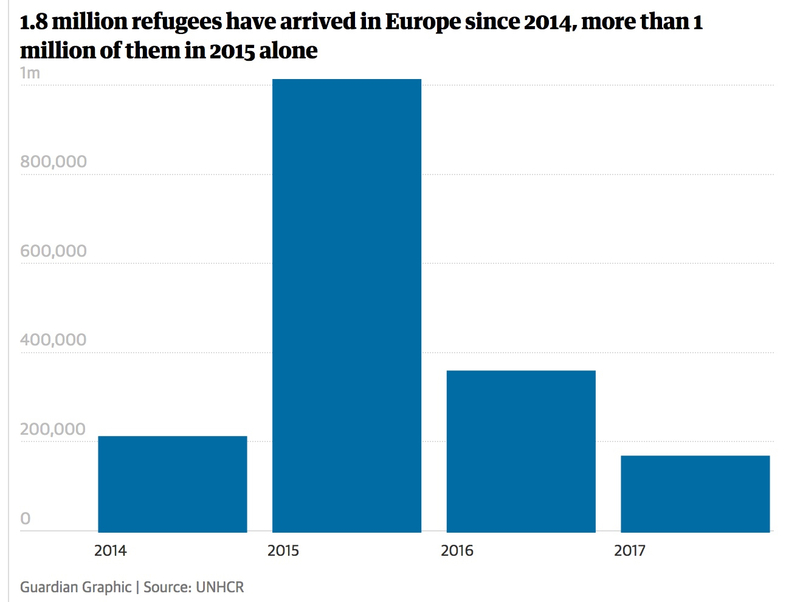 "The worst refugee crisis since the Second World War"
Links to pieces concerning contemporary refugees generally, trans-Mediterranean refugees, migrant smuggling and regulations within Europe. "European governments in melt-down over an inoffensive" pact; "symbolism over toothlessness"
"It has become impossible to have a level-headed conversation about managing migration in Europe." Matteo Salvini's refusal to let the rescue ship Aquarius land 600 migrants in Italy comes in the wake of deadlocked attempts to reform EU asylum policies. With member states in disagreement on refugee burden-sharing, "Europe's capitals are exploring alternatives." Germany plans to unilaterally tighten its asylum system. Austria is "working informally with Denmark and Netherlands" on plans for "camps for rejected asylum seekers outside the EU." charge, rather than leaving Brussels to set the pace in managing refugee policy. "Only member states are able to tackle the crisis effectively." If those who come -generally speaking, the poor and needy- are unable to enter the house of Europe through the front door, they'll keep making their way in through the back windows. In Syria, security forces report called for his imprisonment. Refugee camp in Turkey: "physically alive but psychologically dead." Borrowed $5-7 thousand to pay smugglers for trip Turkey to Greece..."My family is now with me in Leipzig, Germany...for the first time in my life, I feel like a real scientist." "For now the smugglers' business model is safe." "I have to keep trying. I'll never go back to Afghanistan. Sometime in the future, when I sit in a warm place, I'll think back on this and remember everything." shed behind the main train station in Belgrade. Bono: Hope is not lost, but is getting impatient. We should be too. to sending countries before they spiral into anarchy. 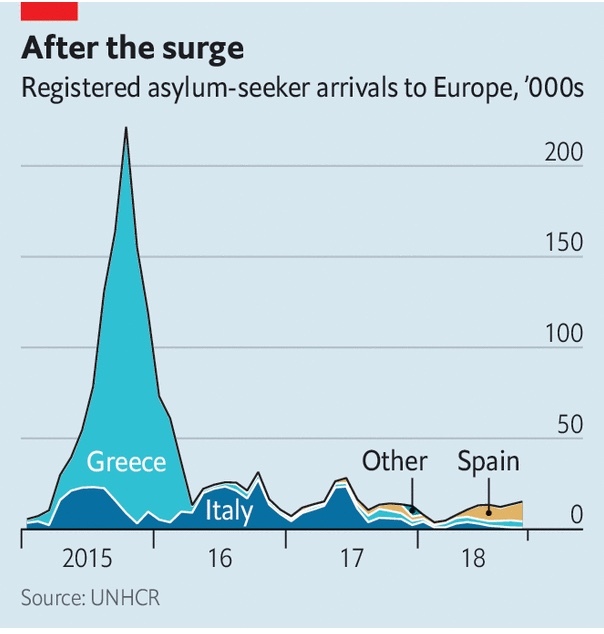 Turkey accepts one refugee returned from Greece for each one taken directly from Turkey to Europe, as quid pro quo for more funding, visa liberalization for Turks visiting Europe, and accelerated consideration of EU membership. 1) Support allowing refugees in Turkey, Jordan, Lebanon to work, 2) Organized registration and processing of claims in Greek "hot spots," (3) more authorized direct resettlement from Turkey to richer countries, (4) deals with source countries to facilitate return movement. Schengen border-free dream at an end? after Paris attacks: Re-erection of internal EU borders? In the first week of November, some 650 Afghans entered Switzerland: three quarters seeking asylum by entering through its eastern borders, and one-quarter having been registered (but not accepted for asylum elsewhere in Europe). Afghans were also nearly three quarters of all asylum seekers arriving at those eastern checkpoints. According to one Swiss border agent, migrants hear through personal networks of delays in entering Germany, and head to Switzerland instead. The Canton of St. Gallen has emergency accommodations for 1,000 (fully occupied, however, as are currently most other currently available facilities in Switzerland). Recently, about 2 thousand Afghans per day have been reaching Germany. 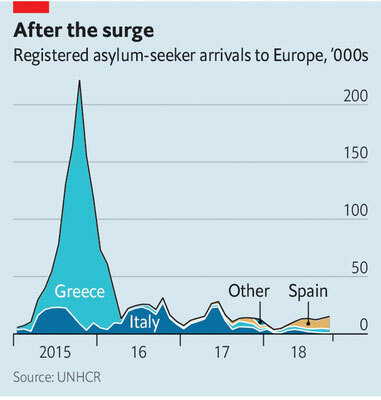 Economist, 24 Oct, 2015: "Refugee realpolitik"
Greek islands likely to have migrants “no longer just passing through"
BBC, 24 Oct., 2015 "Inside Europe"
Economist, 26 Sept, 2015: "Point taken, Mr. Orban"
"Let refugees fly to Europe"
Hungarian border town mayor, in video, encourages migrants in Serbia (enroute to Austria, Germany) to travel via Croatia and Slovenia instead of Hungary (NY Times 19 Sept. 2015). Economist, 19 Sept, 2015: Shooting Schengen. Alterations in border restrictions can indicate wider change, as with the Berlin Blockade in 1948 and the the Austrian-Hungarian border-opening in 1989. New border controls by Germany and Austria could now presage the demise of the Schengen free-travel area in Europe. More..